What happens when you blend a a chocolate milkshake and orange cream shake with stripes of Ghirardelli Chocolate Sauce mixed in for good measure? If you are a fan of Napoleon Dynamite, it can mean only one thing - the new Liger shake. In a nod to the cult classic movie Napoleon Dynamite, Atalanta-based fast food operator Arby's is introducing a new milkshake mash-up, the appropriately named Liger Shake. A liger is a hybrid breed between a male lion and a female tiger. Despite rumors of magical skills, the liger is a very real and breathtaking beast. 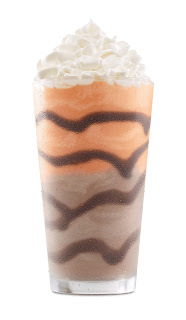 Arby’s Liger Shake is a cross between their Ultimate Chocolate Shake and Orange Cream Shake with stripes of Ghirardelli Chocolate Sauce, resulting in a handsome, liger-like blend of colors that is bursting with rich, sweet flavors. To paraphrase Napoleon, the Liger Shake is "pretty much his favorite drink." But like the elusive liger, this milkshake mash-up is available at Arby’s restaurants nationwide only during the month of June. No Comment to " Napoleon Dynamite Fans Sure to Rejoice as Arby's Rolls Out 'Liger' Shake "